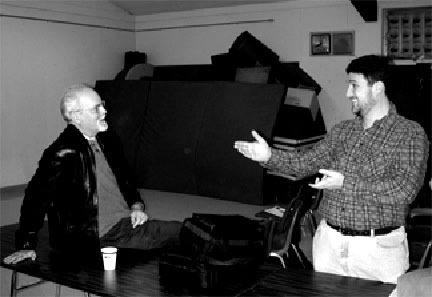 Dr. Jeffrey Moore and Mark Taylor discuss the NASA Pluto mission at the December General Meeting, 12/6/2003. The December meeting included potluck desserts and a White Elephant gift exchange. Photo courtesy of Morris “Mojo” Jones. Dr. Elinor Gates is a support scientist at the University of California's Lick Observatory, specializing in natural and laser guide star adaptive optics instrumentation and operations. Under ideal circumstances, large telescopes have higher resolution than small telescopes. However, the Earth's atmosphere is turbulent and blurs images, so that even the largest telescope typically sees no more detail than an 8" backyard telescope. Either you can put the telescope above the Earth's atmosphere to avoid the blurring, such as the Hubble Space Telescope, or you can use adaptive optics. Adaptive optics (AO) is a technique where the atmospheric turbulence is measured in real time and corrected using a deformable optic. Lick Observatory and the Center for Adaptive Optics are at the forefront of the field in designing and applying AO systems and techniques to astronomy. Dr. Gates will describe the Laser Guide Star Adaptive Optics system at Lick Observatory, as well as some of the current astronomical AO research results from the Shane 3-meter telescope.